As you know, we’ll do just about anything to promote pet adoption! 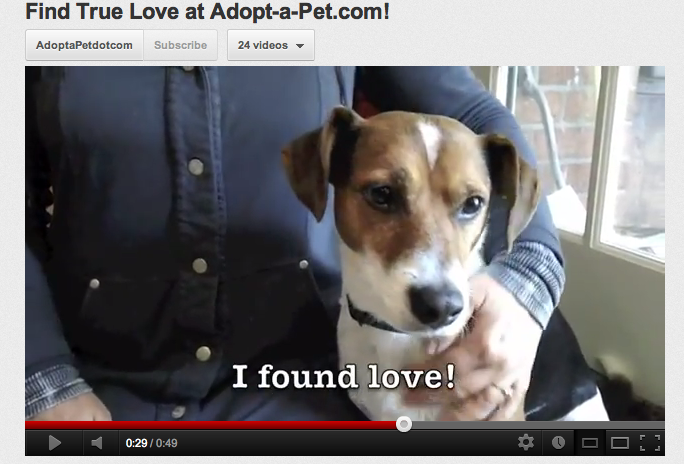 Check out this latest adorable video about finding your match on Adopt-a-Pet.com. Emily Kaplan wasn’t sure if she’d ever find her meant-to-be and then there he was: handsome, affectionate, and interested in moving in with her. No, we’re not talking about her husband, we’re talking about Baxter, her adopted Beagle-Jack Russell mix! Emily says his unconditional love and simple ways keep her more grounded and happier overall. That’s just something we love about pets – they keep us present, they keep us laughing, and they keep us company. Help us encourage others to adopt and find their true love in a shelter pet!